There are two ways HotDoodle can help you block viewing access of your website. HotDoodle automatically blocks viewing access while the website is Under Development and you can additionally add a password to block website viewing access with the website is down for construction. Blocking while Under Development - Websites viewing access is automatically blocked to the public if the site is set to an Under Development price plan. The Under Development price plan is used for the un-billed period during the initial construction of the website by a PenPal. Blocking with a Password - Sometimes you may want to block access to the site while you preform major construction changes to the website that you don't want viewed by the public. 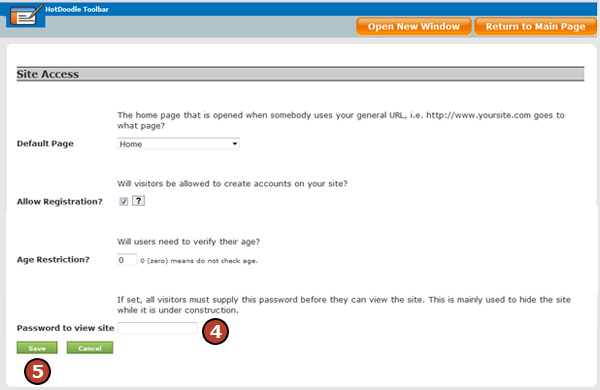 The Site Identification screen allows you to set a "Password to View Site". While a website is under development, the site can be accessed and edited normally, but first a simple challenge screen must be passed. This screen keeps the general public away from the website and also keeps search engines from indexing the content before it is ready. This challenge screen is triggered either by the price plan or by your choosing to set a password to read site. Once passed you will not be challenged again for 60 days. Challenges are per domain/browser/computer so you may be challenged more than once. 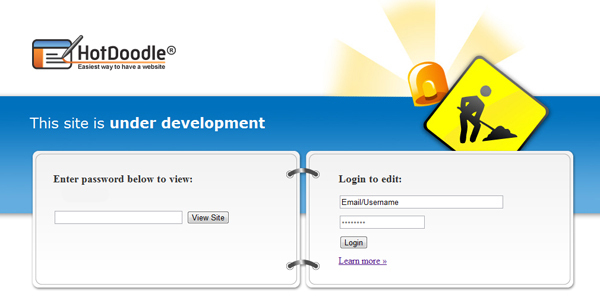 The challenge screen states that the website is under development and gives two ways to enter the website. The challenge screen requests that a viewer enters the password provided on the screen. This option allows visitors to view the website, but stops robots. The challenge screen offers a login for someone who has username and password to view the website. 4. Type in a password for the website. 4. Erase the text in the [Password to view site] field. When a password is established by the website owner to protect the website from public viewing, the challege screen looks similiar to the Under Development challenge screen, except that the screen does not supply the password on the screen. Only those that were given the password by the website owner can enter it and access the website.